A tajine is a Berber dish from North Africa which is named after the earthenware pot it is cooked in. Of course you don't have to own a tajine to cook this dish, any oven proof casserole will do. I always think a large part of the enjoyment of any meal is the visual aspect of it, so I go to great lengths to ensure the table settings look good and the food is presented nicely. I collect plates and other crockery, much to my husband's dismay, as he can never find anywhere to put them. Maybe we need a bigger house? Sauté the onions and garlic in a little Fry Light until soft. Mix all the spices together and add the lamb, making sure the meat is well covered. Constantly stirring, add the lamb to the onions in the pan and cook for a few minutes until fragrant. Add the chopped apricots and enough water to cover. Transfer to an oven-proof dish and bake at 150°C for 2.5 – 3 hours. Grate the carrot and courgette and place in a pan with the couscous and mint sauce. The instructions on the couscous packet suggests 125ml water or stock, but I always find I need to use more. Simmer for a few minutes, stirring to ensure the couscous doesn't stick to the bottom (my husband always berates me for welding food to the pan – it makes the washing up doubly hard for him). Lightly stir some harissa paste into the yogurt. I always use much more than a teaspoon, but it depends on your taste and the strength of the harissa – mine is home made and very hot! Mix together all the ingredients for the pomegranate salad. 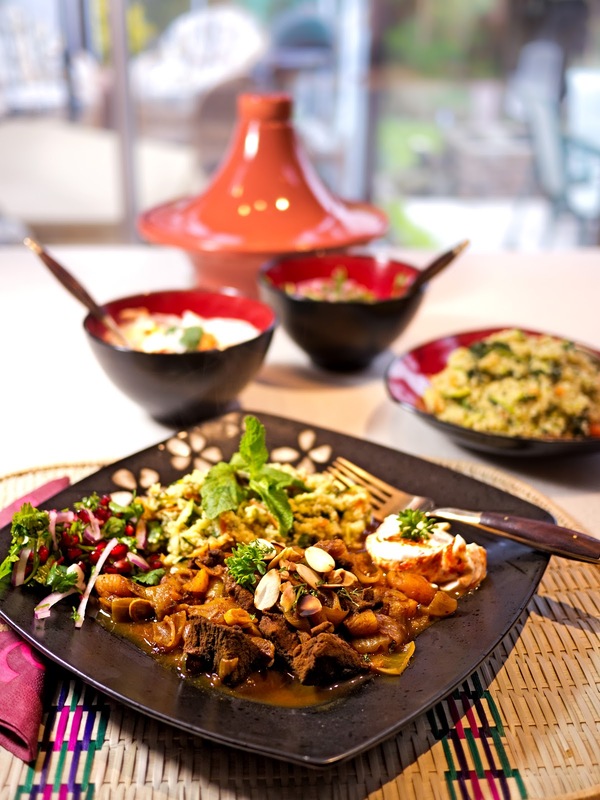 Top the lamb tajine with the toasted almonds and serve with the couscous, yogurt and pomegranate salad. I find this is such lovely comfort food, perfect for a cold dark Saturday evening such as today. The seratonin in the chilli always lifts my spirits and I love the combination of flavours, colours and textures. I bought the tajine in France and brought the mats back from Burkina Faso. The brown plate is from the Range and the red bowls from John Lewis. The gold plated wooden-handled cutlery was bought over the internet.